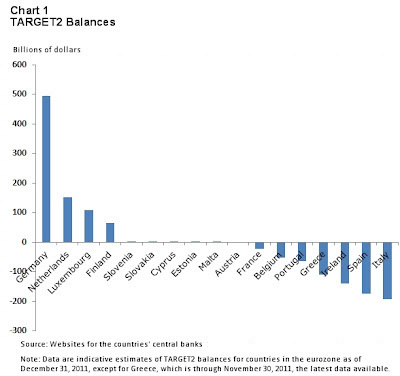 In this post you can see the Target2 balances in the Euro Area. Target2 is the payment system in the Euro Zone that makes sure payments can be easily made between residents in the various countries. When a customer of a bank wants to transfer money to a bank in another country, the bank in the home country can send the money to the bank abroad if it sends an asset as well. The foreign bank would not accept the money alone, because the savings will show up as an liability on its balance sheet and its balance sheet would need assets by the same amount to remain in balance. There are many ways for the home bank to do this. One way for the home bank is to borrow the corresponding asset at the central bank in the home country. The central bank would then borrow the amount from the ECB (incurring a more negative Target2 balance), the central bank in the foreign country will complete the transaction to lend the amount from the ECB (incurring a more positive Target2 balance), to give the asset to the bank which recieved the transferred money. As you can see on average this process occured more from southern countries to northern countries. This shows the capital outflow from the PIIGS countries, which could be of great concern.